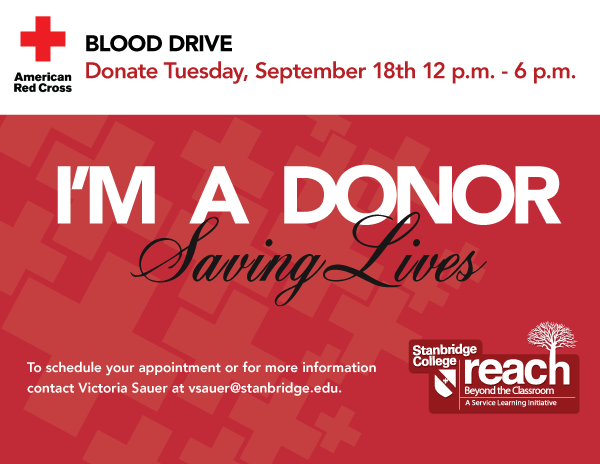 Stanbridge College invites you and your loved ones to the Fall 2012 American Red Cross Blood on September 18, 2012. All summer the Red Cross has faced a critical need for blood donations, and the need is especially urgent as summer winds down and the Labor Day holiday approaches. Southern California’s community blood supply remains in a fragile state and additional donations are needed to ensure an adequate supply is available through the end of the summer. Patients are counting on us. Time: 12:00 p.m. – 6:00 p.m. – Appointments are scheduled every 20 minutes. Due to certain limitations, some people may be ineligible to donate blood. But you can still help! Volunteer to help the Red Cross with registration tasks on the day of this event. We need 2 volunteers for two 3 hour shifts from 12:00pm – 3:00pm and 3:00pm to 6:00pm. Please email vsauer@stanbridge.edu for more information.